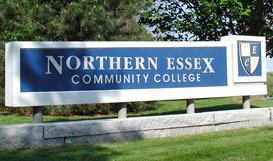 Meetings are held the 1st and 3rd Fridays of each month from 5-8 PM in room TC219 of the Tech Center on the Haverhill campus of NECC. As a visitor you may park in the Tech Center parking lot for free and no permit is needed. We meet in the Tech Center (marked “TC” on the map linked above). Enter the Tech Center through the ground floor doors and head up to the 2nd floor where you will find room TC219 at the end of a long hallway.